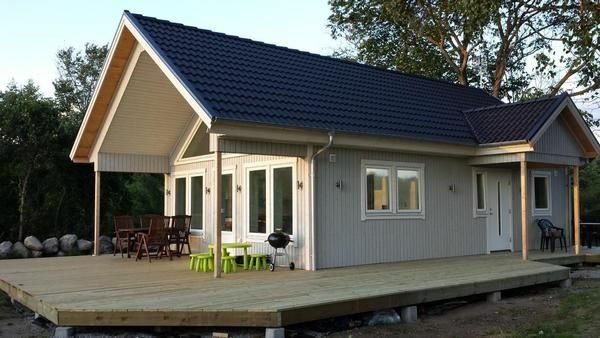 Our brand new chalet (built in 2014) is located 400 meters from the sea in Sandviken. Sandviken has a very nice and child friendly beach, where there are both glass kiosks, restaurant and playground. It is close to Sölvesborgs golf course about 5 km. The cottage is situated on the outskirts of Sandviken on a large plot (900 m2). Sölvesborg center is about 9 km (7 km on the bike over the new bike bridge). In Sölvesborg you will find everything you need, Systembolaget, shopping, dining, glass boat, etc. It is also close to Mjallby (7 km) where you have a grocery, gas station and cafe. Unfortunately, I had no pictures of the nice beach in Sandviken, but Googling yourself, and you will see how beautiful it is. About 1 km long, so plenty of space for everyone. There is also a jetty located in the part closest to our cabin. Perfect for a morning or evening swim. There is a very beautiful natural area directly adjacent to the cottage. One can walk along the sea to the lighthouse and then go to blah on grass honor that goes all the way out into the ocean and beech forest that goes down to the water. The cottage has two bedrooms, one with a double bed and one with a loft bed (upper bed is a mattress and the lower bed is a common elastic bottom. There is also a sofa bed in the living room with space for 2 persons. In the loft (standing height is about 185 cm in the middle ) is where 4 pcs mattress. Living room with sofa and fireplace, and 40 inch flat screen TV with the usual channels. There is dining area (with extra flaps) with space for 10 persons. Bathroom with shower. Room 2: Bedroom with loft bed (2 p) (upper bed is a mattress and the lower bed is a common sprung. Kitchen with induction hob / oven, microwave, dishwasher, fridge / freezer, coffee maker. All kitchen equipment available. 2 comfy chairs and lots of scissors chairs, and children's table in plastic. Roofed patio and decking around half of the cottage. One can get both sun and shade throughout the day. 2 adult bikes with child seats. Please note that the tap water is not very nice to drink. It is fine for taking a shower or doing the dishes but we will provide fresh water from a tank to cook and to drink. Of course there will be enough water provided for your stay. - Final cleaning: per object and week Costs amounting to 50 EUR (Mandatory). - Bed linen: per person and day for rent at a price of 2 EUR (Mandatory). - Towels: per person and day for rent at a price of 2 EUR (Mandatory).